The search of a landfill site for missing RAF airman Corrie Mckeague, who vanished during a night out in September 2016, has ended. 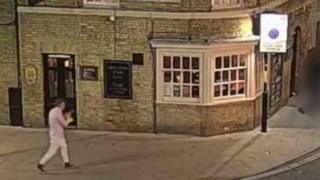 Police believe Mr Mckeague climbed into a waste bin in Bury St Edmunds and was taken away by a bin lorry. The search of a site at Milton, Cambridgeshire, restarted in October after a search there ended earlier in the year. Suffolk Police said "no trace" of the airman had been found. The force said it was "content" he was not in the landfill areas that had been searched and the investigation into his disappearance would continue. Mr Mckeague's mother, Nicola Urquhart, said by searching the waste site the police had given her "immeasurable peace of mind". His father Martin said they had a "lifelong debt of gratitude" to all those involved in searching for his son. Mr Mckeague, who was 23 at the time he went missing, was last seen at 03:25 BST on 24 September 2016. He was captured on CCTV entering a bin loading bay known as the Horseshoe and his phone was tracked as taking the same route as a bin lorry. Police started a 20-week search of the landfill site in March before ending it in July. The latest excavation has been focused on an area next to the site of the original search. Det Supt Katie Elliott said there were "a number of theories" about what happened to Mr Mckeague and they were "continuing to test the evidence".